Anyone who has played Airsoft with me knows I love using Pyrotechnics in game, whether it is a Solid state BFG such as the TRMR or the SWAT VTG, TAG round or a disposable bang, sometimes they are the difference between gaining entry to a tricky to access room or a stalemate, the difference between winning and losing. 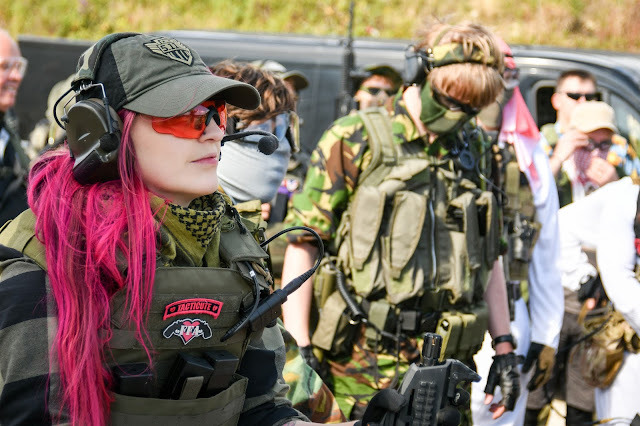 These devices have become integral to Airsoft game days with an increasing amount of players using them and the choice available is quite comprehensive. So when Nige handed me a bag full of Valken Thunder B Shocker Grenades my eye lit up at the prospect of testing them! The Valken Thunder B Shocker is a CO2 powered sound distraction device which utilises a CO2 cartridge and a pin/spoon system to create a 130 db bang, once a cartridge is inserted and the pin is removed/spoon released the cartridge is pierced and the plastic shell begins to fill with CO2 – which is recognised by a distinct hissing sound. The shell has been designed to have a weak seam to enable the user to ‘predict’ when the device will detonate. The grenade is split into two parts, the reusable section which contains the munition (CO2) and the disposable plastic shells. It is worth noting that you can also fill the shell with BBs to turn it into a BB grenade, and a handy little tip I received was to also place a small amount of talcum powder in it to make a cloud as well. Now one thing I will say about these grenades is they are SO loud and I would seriously suggest wearing ear protection whilst using them, I did not expect the bang that came from this relatively small piece of kit. They are definitely a top notch distraction device in fact, if one of these went off next to you I’d be surprised if you didn’t need new knickers. When using these in game, after the device had deployed its munitions there was almost always a shout of ‘what the f*ck was that?!’. In regards to what the grenades primary objective is - distraction, I’d give it a 10. After deployment people are more concerned with making sense of what was just detonated than their surroundings meaning you can go to work. I can think of a fair few game situations where I could have done with something this loud to scare the opponents. I really like the aesthetics of the Shocker grenade, it mimics a real world grenade design in a classic green colour. The shell has been designed with ergonomic indents on the body of the shell to make them more tactile and easier to handle and I love the raised skull design that is on the side. The white weak seam is easy to identify and it is easy to determine how the device works from how it looks. I did unfortunately have some problems during testing mainly down to flaws in the products design, for instance whilst holding the loaded grenade at an odd angle the pin slipped out which would have been no issue if I was also holding the spoon however as I only had my hand around the shell it could have been an issue if I hadn’t heard the sound of seeping gas and thrown it to a safe distance before it had chance to detonate. I feel this could be easily rectified with a simple change in design of the pin, if the pin was hooked this would eliminate this problem. I would have also liked the detonation time on tests to be a little more consistent for me to gauge when the device would go bang – the time between pulling the pin and the device detonating was between 4-10 seconds which is too big a variant with such a product in my opinion. A few of the bangs did take me by surprise. The very last test of the day unfortunately rendered the device unusable – now I hold my hands up, this could have been user error but I feel this could be an issue other players experience so it must go in the review. We primed the grenade, pulled the pin and threw it, bang it went and everything looked good until we inspected the device closely after attempting to fit a new shell. The previous shells thread had become lodged in the device thread, we tried removing the shell but with the force of the detonation, it was well and truly lodged in there rendering the reusable part of the grenade a dud – I feel that this could maybe be rectified by using a pair of pliers to dislodge it. Overall, I was pretty disappointed with the Shocker Grenade. One of the main thoughts whilst writing this review was ‘great idea but not ready yet’, although the product looks pretty badass, is innovative and has great potential to be a huge hit with the Airsoft community but there are a few improvements that would need to be made in my opinion before it is ready to hit the wider market – such as a redesigned ‘hooked’ pin to ensure it doesn’t fall out before the user is ready to deploy the munition, especially for players that like to have nades hanging from their rigs, I also feel that it would need to be more predictable in regards to detonation times as they were a little inconsistent for my liking, with products of this nature the detonation time needs to be predictable every time to ensure user safety (no one needs one of these going off in their hand!). I would love to see these improvements made and give these another try, but for now I’ll be sticking to my tried and tested favourites. Hardwick, K. (2016). Valken Thunder B Grenade. Airsoft Action. 67 (Nov), 60-61.